When not guiding, Katie spends her free time at her metalsmithing bench creating jewelry that depicts her love of life in the mountains and on the river for her Etsy shop Dirt Road Wares. She is actively involved in the conservation of her native Chattooga River Watershed, has developed a near obsession with vegan butter and spends as much time as possible on the water with her husband Daniel and their dog, Beans. 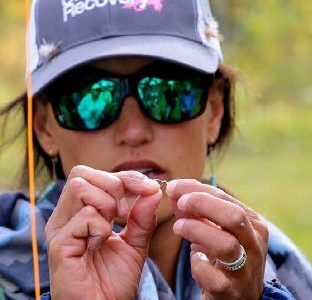 Article by Catie Webster, a writer and fly-fisher based in Boulder, Colorado. 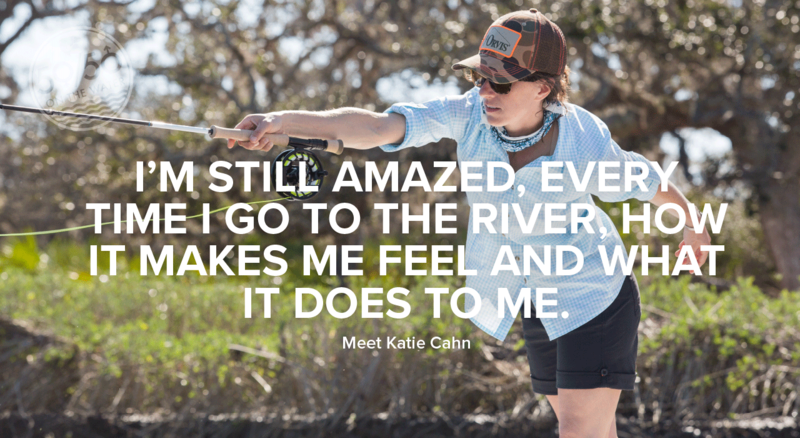 Growing up amidst mountains and rivers, Katie’s course has often followed theirs. After kayaking, she started guiding, running jet boats, taking photos. A natural progression, if you’re Katie Cahn. She was well on her way to being a river-rat, and the more time she spent on the water, the more she recognized how it changes you, how it has a strange ability to be coming and going simultaneously that inevitably brings about a shift. 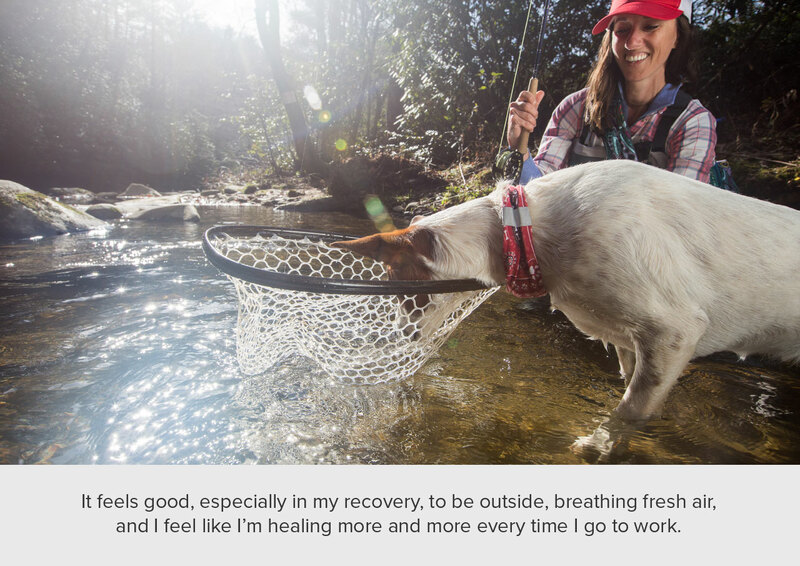 After years of working on the river, Katie felt that shift. While her love of the water hadn’t changed, the way she wanted to experience it had. Her college campus in western North Carolina sat on the banks of the Tuckasegee River, and she picked up a fly rod and learned to fish much the same way she learned to kayak—by doing it. 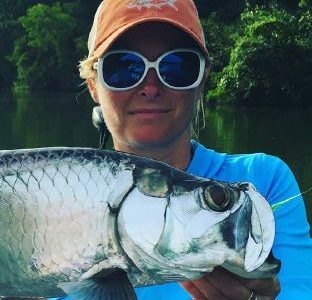 She asked friends for tips and advice, Googled “how to cast” and watched countless YouTube videos, but more than anything else, she went fishing. The river was 500 yards from her front door. So, before class, between classes, after class, she fished. Not one to play it safe, she hopped fences, accidentally discovered the timing of dam releases, and learned which property owners cared about a young woman with a fly rod traipsing across their property. In the fall of 2016, Katie had taken on a new adventure, marriage, when she found out she had cancer. Three weeks after her wedding, she was being prepped for a radical nephrectomy, and nine weeks after that she was on the operating table again, fearful that the cancer had returned. Though the second tumor was benign, she had her appendix and left ovary removed as a precaution. What was supposed to be one of the happiest times of her life was waylaid by fear and uncertainty. What if the cancer returned? What if it was incurable? 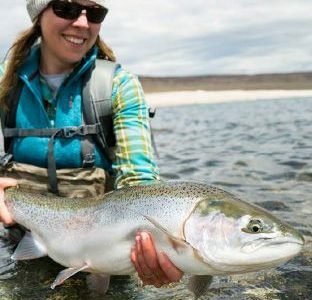 Battling depression, and even thinking about ways to end the pain quickly, she yearned for the old Katie, the carefree-just-married Katie that was planning fishing trips with her husband, not the one stuck in a hospital attached to an IV. While she’d never be the Katie who never had cancer, she could be a Katie who’d beat it. She made her health her top priority, and, as with anything else she’d done, Katie took action. She gave up alcohol and meat. She refused to spend her days stuck in meetings about meetings, sitting under fluorescent lights and breathing stale air. This Katie would make a life that allowed her to move through the world in a way that helped her navigate fear and uncertainty with a firm grasp on her health and the future she would create. And so, in February of 2017, when a call came from Headwaters Outfitters, just south of Brevard, NC, she was uniquely prepared to answer it. She is most certainly that.